In a large heavy pot, heat the oil over medium high heat. Add the chopped yellow onion, chopped bell pepper, 2 cloves of minced garlic and minced jalapeño pepper. Stir and cook for about 3 minutes, until the vegetables are soft. Add the diced zucchini and 1 cup of corn. Cook until soft and the vegetables start to brown around the edges. Add 2 tablespoons of chili powder, 1 tablespoon of cumin, 1 teaspoon of salt and ¼ teaspoon of cayenne. Stir well. Add 4 chopped plum tomatoes and ¼ cup of chopped cilantro. Stir well. Add 3 cups of beans, 1 can of tomato paste and 1 cup of vegetable stock. Stir well and bring to boil. Reduce the heat to medium low and simmer for 20 minutes. Remove from heat. 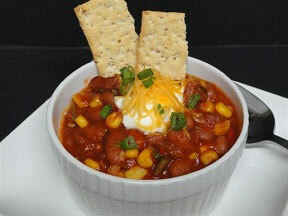 Ladle chili into bowl and top with spoonful of yogurt and shredded cheddar.